Science fiction movies seemed pretty rare prior to 1950...you got a few here and there (like Metropolis in the silent era) but they didn't really come into their own until the 1950s. In fact Sci-Fi films of the fifties seem to be a genre all their own. Some were excellent, some less so, but most of them seem at least interesting to check out, if for nothing but to see how we might react to aliens from outer space and other such things. This is definitely one of the better ones with first rate special effects by Ray Harryhausen, a stop-motion artist normally known to work with mythological beasts such as might appear in the Sinbad movies but who nonetheless gave us some first rate flying saucer effects here. Not only that, but we get to see most of Washington D.C. get destroyed...the Washington Monument, the Capitol building, even the Lincoln Memorial all reduced to rubble at the hands of these mysterious aliens. Interestingly enough we do get to see the interior of a saucer but it's all rather bare and we do get one look at an alien but all in all it's quite a good action film. Check it out. I got this DVD as part of a set...The Fantastic Films of Ray Harryhausen: Legendary Science Fiction Series which includes four other movies. The movie was also released by itself. The disc has a few extras but it was re-released early last year in a 2-disc special edition. I just got this as part of a sci-fi set of classic 50s movies! Nice review, Roger. The reason sci-fi came of age then was paranoia. The Cold War was just, erm, warming up. Switch the aliens for Russians and watch the Washington sequence again! Star Trek followed with subtexts of its own, in a "can't we all just get along" fashion in the 60s, but still... Klingons, Comrade? Metropolis wasn't made by paranoid Americans, but it's actually a very interesting political film considering it was made by a German. What was Lang trying to say with robotic like workers in factories? Good sci-fi is always laden with metaphors. I haven't seen it yet, but a lot have said that the new Trek is fantastic fun, but lacks that undercurrent and they hope the sequel introduces a hint at least. A boy escapes when his parents are murdered by a cattle baron. Years later that boy returns as a young lawyer (wayne) with a six-shooter and a deadly aim. This picture was shot during John Wayne's "B" western period which pretty much lasted the entire decade of the 1930s and which was bookended by two big "A" pictures, The Big Trail and Stagecoach. "B" pictures were films that were shot quickly (usualy in about a week) and which had short running times of about an hour. Some were okay, some were pretty good...I don't know if any ever reached the "great" end of the scale, though. This one would reach the "pretty good" end of the scale. It has some good action scenes with a few nice stunts (which was telegraphed by the fact that Yakima Canutt, fine stuntman but not a very good good actor, was in the cast). There's some good photography with some nice outdoor locations. The plot is the usual staple mixing revenge with a badguy trying to keep the water rights he has no real...ahem..."right" to keep...heh heh. But it's a decent kind of film kids ate up in that innocent time of the past. There aren't a lot of DVDs that have nice quality prints of the "B" pictures and this is definitely one of those few so I'd recommend it if you're a fan of "B" westerns. Despite the title, you won't find Zorro in this serial. You won't find him in it...and you won't ever hear his name mentioned in it. In this 12-chapter serial, you instead have a similar character who is known as The Black Whip. As the adventure begins, he is a masked man who is protecting the area against the badguys but he is killed before the end of the first chapter. His guise is then taken over by his sister (played by Linda Stirling) and the adventure continues from there. This was made by Republic who was probably the best at making top-notch exciting serials or cliffhangers. I have to admit I haven't yet reached the end of this serial (I'm about halfway through) but I've still made it through and I look forward to an exciting conclusion. Somehow, I expect the good guys to win...and so far, I've enjoyed what I've seen quite a bit. This serial is now in the public domain and has been released by many companies. Mine is from The Serial Squadron, a small independent company. This is on 3 DVD-R discs and the quality is pretty nice. In recent years, they've fiddled around with some titles which has tarnished their reputation but this title remains one of their better ones. I have this serial my my Zorro's Cliffhanger Collection. I enjoyed it too. And Thanks Roger... I forgot about these... may have to watch one of the Zorro serials for my "Z"! Wonder which one I should watch again. Didn't watch it for quite some time, but it's a good David Friedman production when he was in his costume period phase and no it isn't an adult film. It's a good adaptation with a lot of production value, a typical drive-in/Pussycat Theatre sexploitation flick. I did not like the Thin Red Line either. Thanks for pointing out it was the same director. Obviously I don't his style as I would have rather spent the night sharpening pencils down to little tiny bits. FWIW I enjoy classical music. Not much of a rock and roll guy any more. erm... I like Solaris too. According to Phil Hardy's The Western, this movie was originally written in the 70s for Steve McQueen but it wasn't filmed until 1990 and Tom Selleck got the part. Selleck made a lot of westerns in his time...possibly more than any current actor, though most have been for TV. This is his one western (as far as I know) to hit the big screen and it's a good one. The plot has him coming to Australia, apparently hired by rancher Alan Rickman to shoot wild dingos but he really wants him to off native aborigines. Selleck (as Matthew Quigley) doesn't like that so they two quickly become enemies. I really enjoy this movie...Selleck is a great cowboy, Rickman makes a fine villain, and Australia makes a fine (if different) landscape to set it all on. We also have a fine director...Wincer did another little western you may have heard of...it's called Lonesome Dove. I also love the film score which is by Basil Poledouris...hmmm, come to think of it, he did the music for Lonesome Dove, too. Okay, Laura San Giacomo is not your normal leading lady, playing Crazy Cora who keeps calling Matthew Quigley by the name of Roy...but even she is endearing in her own way. Somehow I knew you would, that's why I threw it in there. At least with that one I could see the appeal, it just did nothing for me personally. To me Tom Selleck is a true on-screen cowboy, just like those of the past. He is one of the few that the role is just so natural. Loved him in Monte Walsh too. One of 6 "B" westerns that Wayne shot for Warner Brothers in the early 30's, this has two Dukes in it...Duke Wayne himself and his white stallioin, Duke. This is a sort of mix between a western and a scary mystery haunted house kind of movie. John Wayne plays a young rancher who comes to a mostly deserted town with his black friend Clarence after receiving a mysterious letter...a young girl has also come after receiving a letter. It turns out an outlaw gang is after the gold in a mostly abandoned gold mine, of which the girl's father was wrongly cheated out of his half. There is some nice eerie atmosphere here along with the usual high-energy heroics. Unfortunately, this wouldn't play well today due to the black man's super-scared caricature performance which was so prevalent back in those days...the "lawdy feet, do yore thing" kind of performance. But if you remember it was a product of the time, you can still watch this film and enjoy it. The DVD offers a nice print of this movie. There are no extras but the DVD does feature no less than three "B" westerns starring John Wayne. Besides Haunted Gold, you also get Ride 'Em, Cowboy and The Big Stampede. I just completed my Alphabet Marathon! 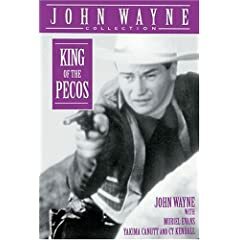 Matty Ross (Kim Darby) tries to find someone to track down and bring in the killer of her father and she winds up teamed with a cantakerous U.S. marshal named Rooster Cogburn (John Wayne) and a headstrong Texas ranger (Glen Campbell). Lively directed by Henry Hathaway and featuring John Wayne's Oscar-winning performance as the one-eyed Cogburn. Glen Campbell once said his acting was so bad that he made Wayne look so great by comparison that he won the Academy Award. I'm not sure that's altogether fair...but Campbell is definitely in over his head in this film. But other first-rate films have had a bad performance or two (remember Ricky Nelson in Rio Bravo?) and he doesn't bring it down too much. Overall we have some fine performances (including John Wayne apparently having a heck of a time) and a first-rate western. There is some nice photography here in picturesque locations and a solid musical score by Elmer Bernstein. 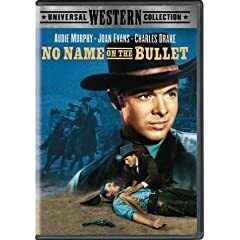 I have the Special Collector's Edition of this disc and it does have some nice features including cast and crew (including Kim Darby and Glen Campbell) talking about what it was like working with Duke and a too-short piece where a few historians talk about real western outlaws of the Old West. Gunman John Gant arrives in town and this sets the townsfolk to thinking. Gant usually comes into a town and is there to kill a man he has been paid to. As time goes on, fear starts to set in as no one knows exactly who it is that Gant is after driving several to desperate acts including suicide and drinking whiskey to try to build up the courage to take him on. Audie Murphy stars as Gant in a fine deliberate performance aided by a first-rate supporting cast. It doesn't have tons of action but this is still one of Audie Murphy's better westerns. The DVD has no extras apart from the theatrical trailer.